Home > KMS	> kMS ver. 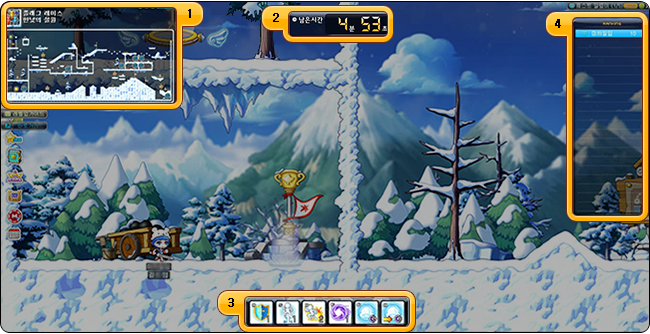 1.2.203 – MapleStory FLY: Your Story, MAPLE! kMS ver. 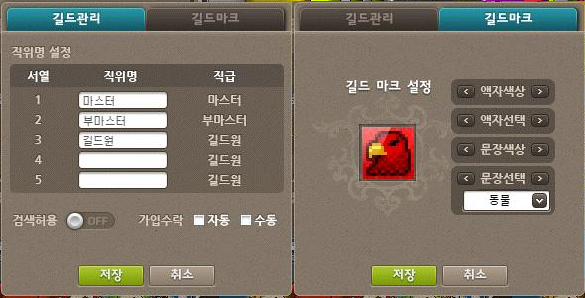 1.2.203 – MapleStory FLY: Your Story, MAPLE! In addition, the Family system has been deleted. I don’t think they plan on bringing it back, but really, after the nerfs it was only good for free teleports haha. In order to help everyone get used to the new guild system, a tutorial has been added! First of all, the maximum level of a guild has been increased from 10 to 25. Pressing ‘G’ will open the guild window If you are not currently in a guild, you can choose to search for one (criteria such as guild level, guild characters’ levels, etc. can be specified) and apply (the guild master must accept you) or create one. 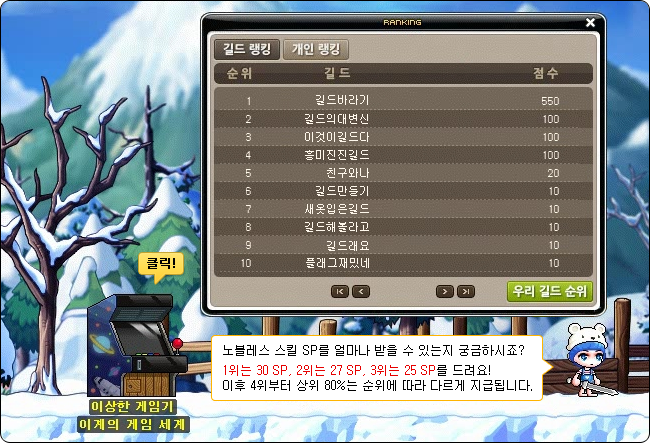 To create a guild, you must now be level 100 and pay 5m mesos instead of being level 10 and paying 100k mesos. If you are in a guild, you’ll see the newly updated Guild window, including an upgraded board and the guild alliance. After the removal of the family system, its button on the character info window has been changed to the guild button. You can even change your guild’s mark through the new UI, without having to go to the Guild Headquarters. At a later date, guild challenges will be added. If you wish to leave your guild, you’ll see the contribution you’ll lose. The Guild Point system has been reorganized! A guild’s level is now based on the total contribution of all the guild members, and whenever you gain contributions, 30% of it will be given to your guild as GP while 70% will be given to you as IGP (individual GP). 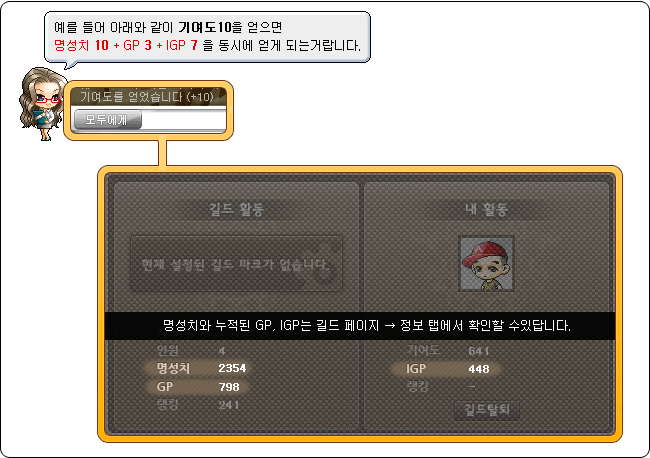 Guild skills no longer use mesos, they now use up either GP, IGP, or they are passive. IGP skills affect only yourself while GP skills are for the entire guild. Speaking of which, the guild skill tree has been completely redone! 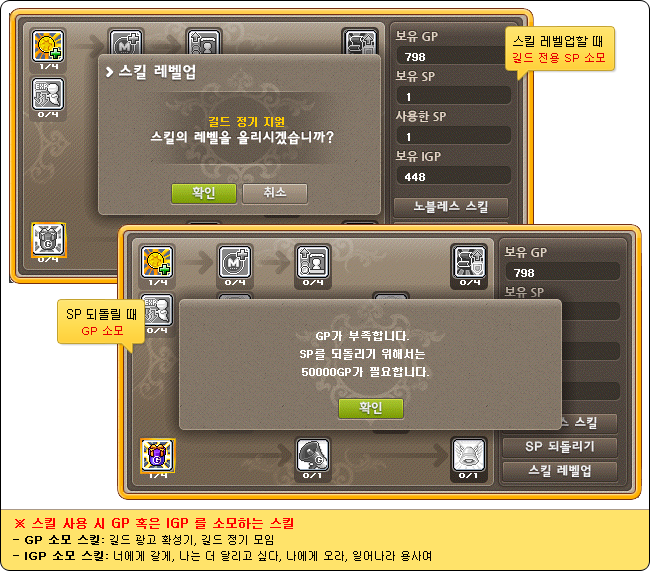 Now, each time your guild levels up, you’ll gain 2 SP which can be used to level up your Guild skills. Each column requires a certain amount of SP invested already (e.g. you must have used 8 SP in the 1st column before you can put any points in the 2nd column). There are 9 passive skills and 6 active (3 individual, 3 guild). If a skill does not have a listed duration or cost, then it is passive for all guild members. Skills that require IGP can be activated by anyone but ones that require GP can only be used the guild master. In addition to these 15 skills, you have 3 more Noblesse skills. These can be unlocked if your guild ranks high on the Flag Race rankings (mentioned later). The rankings are reset once a week. A new type of content called Flag Race has been added! Compete against other guilds to be the first to the goal three times! Anyone level 55 or over that is in a guild can participate, and invitations are sent out at 12pm, 7pm, and 9pm. Inside, you will be transported into the course after at least 8 people have arrived. You can check the minimap for the general layout, as well as the position of other characters. You have a maximum of 8 minutes to finish Flag Race. The Skill Bar contains the 6 Action Bar Skills you can use in Flag Race, and the Ranking window shows the current rankings of participants. You must be one of the first people to successfully complete the course three times, by reaching the Goal. After one person has finished, the rest will have 1 minute before the Flag Race automatically ends. There are three different courses based on the time of day. Sometimes, items might be randomly created. Picking them up will fill up skills in your Skill Bar. Use these skills to win the race! Heavy Stander (A): Buff yourself to ignore all knockbacks for a short period of time. High Jump (S): Jump high in the air. Rush (D): Quickly move horizontally. Cannon Shot (F): Shoot a cannonball forwards, hitting other users. Go to You (G): Move to one of your other guild members that are participating in the race, randomly. Come to Me (H): Summon one of your other guild members that are participating in the race to your location. Around the map, there will be mounted fixtures which you can ‘sit’ on and use to interfere with other users in the race. After completing the Flag Race, you will receive experience and Guild Ranking Points. You can check the rankings at the Strange Game Console, the top teams will even receive Noblesse skills (as mentioned above)! Until December 12 (next big patch will be coming on this day! ), if you participate in at least one Flag Race, you’ll receive a 30 day Contribution Bag and a 30 day Guild Member’s Speech Bubble Ring. The bag gives 100~200 contribution once per day. Huh. Family system got deleted. Wait what does he mean by “Increases Mesos or Mileage by 2/4/6/8”? Is it by +2 or 2% or x2? Not sure about mileage, but only having +2 or 2% mesos sounds like absolute crap lol. nah i dont think so…looks like the old family system was put into the new guild system, so there is no need for a family system anymore. Finally, the family system is gone. It was quite useless IMO. Glad to see that some features got implemented into the new guild system. Max, are the new pets supposed to be pastries? If so, I think the names should be Choux Choux pets (reference to the type of pastries). That would make sense, yes! So each skill will need 1 SP to level up? I’m pretty confused over the SP investment requirement thing. how if current guild aldy reach level 10? lol everything gonna restart?? then keep leveling it, duh. Seems cool! Cant wait for gms to get it! Is this update supposed to be the last part of FLY? That was 2 words and a symbol. There are still 2 words, so your comment is unnecessary. Don’t fix what’s not broken, fool. ….five mil? that’s a bit excessive. Glad they revamped the guild system makes being apart of a guild cooler now. MapleStory 2 – New Monsters! MapleStory 2~!